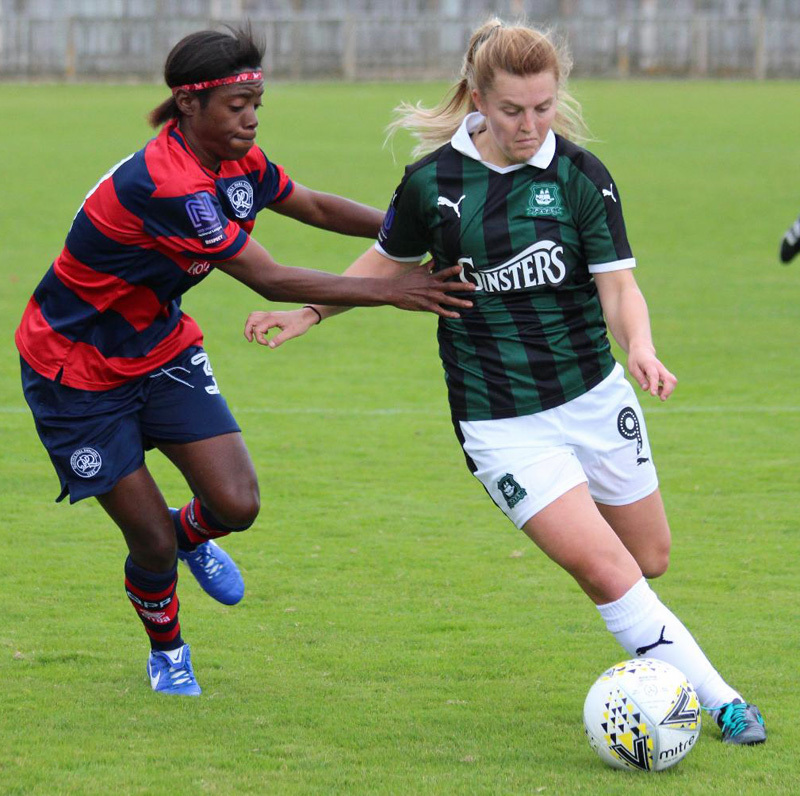 Plymouth Argyle Ladies were given a bit of a fright in London before coming away with a 3-2 win against Queens Park Rangers that puts them in touch with the leaders in the National League Premier Southern Division. Argyle had to make a few changes as flying winger Amber Pollock was unavailable and Steph Beck was taken ill overnight and could not travel. This allowed the management team of Trevor Rodd and Dave Leonard to select England under-20 international Jessica Jones for her debut, as well as giving 17-year-old Cornish midfielder Faye Ivall her first start of the season. Despite the changes, Argyle stuck to their favoured 4-2-3-1 line-up with Welsh international Helen Bleazard leading the line. The Pilgrims started on the front foot and almost took an eighth minute lead when Kayley Lane, who was playing out wide, beat the offside trap only to see her effort superbly tipped over the crossbar by goalkeeper Gillian Kasirye. Katie Middleton then had a header saved. The visitors eventually took the lead in the 25th minute when Bleazard beat the offside trap to provide a clinical finish. And Argyle doubled their lead just before half-time when Bleazard rose the highest to head home. In the second period, two goals in four minutes drew QPR level. The first came from Locke in the 65th minutes and then Stephanie Anes headed in an equaliser. 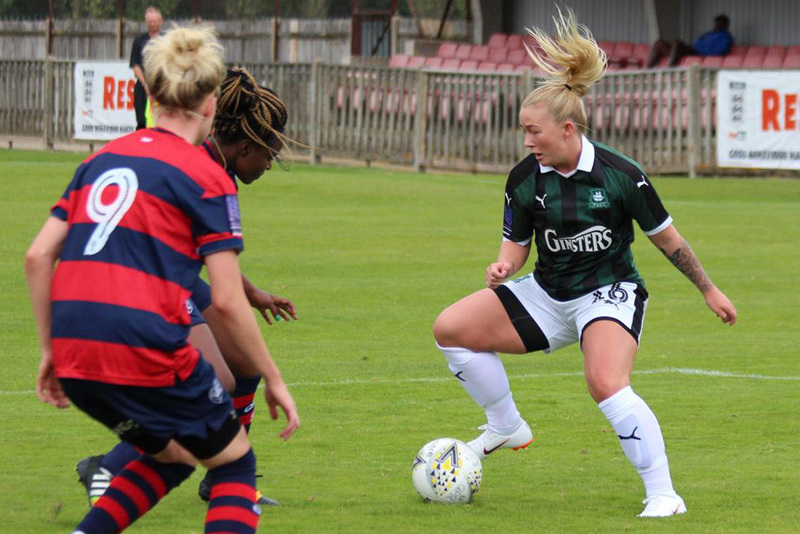 But Argyle eventually grabbed the winner with seven minutes remaining when the dangerous Zoe Cunningham raced away from the home defence to score and settle the contest. Pilgrims joint manager Dave Leonard said: “We never looked like losing but it is all about game management. Argyle: Lyndsay Rogers, Darcey Hepworth, Kate Middleton, Becca Wakley, Mollie Taylor, Becky Dandridge, Faye Ivall (Tamsin Medd-Gill), Kayley Lane, Jessica Jones, Zoe Cunningham, Helen Bleazard. Not used: Ebony Dover. In the South West League Western Division, Argyle’s development team also won 3-2. They triumphed at Weston-super-Mare. It was a testing game for the young Pilgrims, who having raced into a 3-0 lead let in two quick goals before seeing out the game for victory. In fairness, Argyle could have been well clear of their hosts but for the woodwork which denied Maya Ridge four times. However, she still managed to net a double. Ridge fired against a post with an angled drive and minutes later smacked the ball against the crossbar. After dominating for long periods, Argyle had to be grateful to goalkeeper Sarah Prior, who made a superb save. But eventually 16-year-old Ridge found the back of net with an angled 25-yard drive only to then fire against the outside of a post. The second goal quickly followed with Ridge making it 2-0 at half-time. Argyle kept up the pressure in the second half and made it 3-0 when another 16-year-old Hannah Brock fired into the roof of the net. The ever dangerous Maya Ridge was once again denied by the woodwork. But the game was turned on its head when, with 20 minutes to go, Argyle needlessly conceded two Ellison Roberts goals.